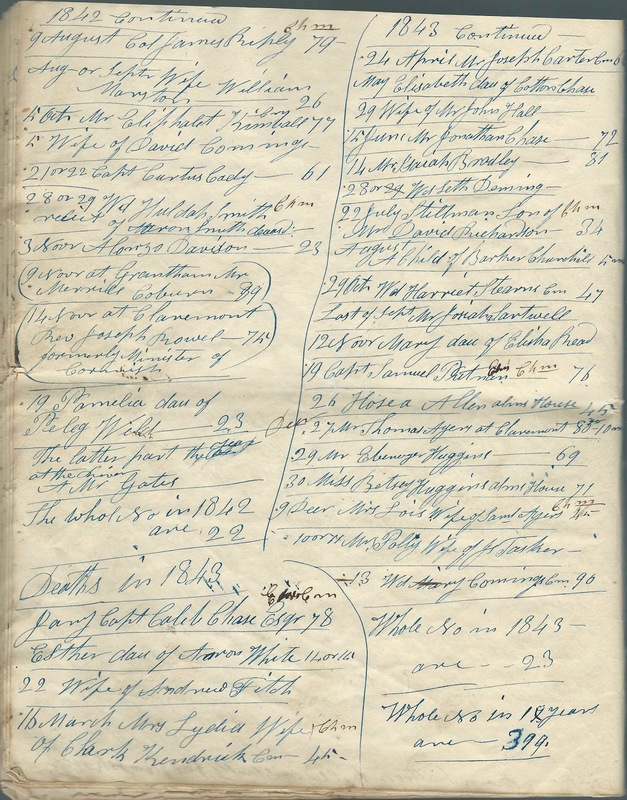 Page from a journal handwritten by an unknown person, but likely by a descendant of William Ripley, that lists the deaths at Cornish, New Hampshire from 1826 to 1850. This post covers deaths in 1843. Capt. Caleb Chase Esq., ?, Cm, 78; mentioned on page 70 of History of the Town of Cornish, New Hampshire, with Genealogical Record, 1763-1910, Volume 2. Esther, daughter of Aaron White - 14 or 15. Esther E. White, born July 16, 1828, daughter of Aaron White and Rebecca (Williams) White; as mentioned on page 413 in History of the Town of Cornish, New Hampshire, with Genealogical Record, 1763-1910, Volume 2. 22 - Wife of Andrew Fitch. She was Polly (Stone) Fitch, born January 30, 1796, daughter of David Stone and Ruth (Kenyon) Stone; as mentioned on pages 155 and 356 in History of the Town of Cornish, New Hampshire, with Genealogical Record, 1763-1910, Volume 2. 16 - Mrs. Lydia, Wife of Clark Kendrick - Chm, Con [? ], 45. She was Lydia (Smith) Kendrick, born 1798; as mentioned on page 239 in History of the Town of Cornish, New Hampshire, with Genealogical Record, 1763-1910, Volume 2. 24 - Mr. Joseph Carter, Cm, 66; sketch on page 53 in History of the Town of Cornish, New Hampshire, with Genealogical Record, 1763-1910, Volume 2. Elisabeth, daughter of Cotton Chase. 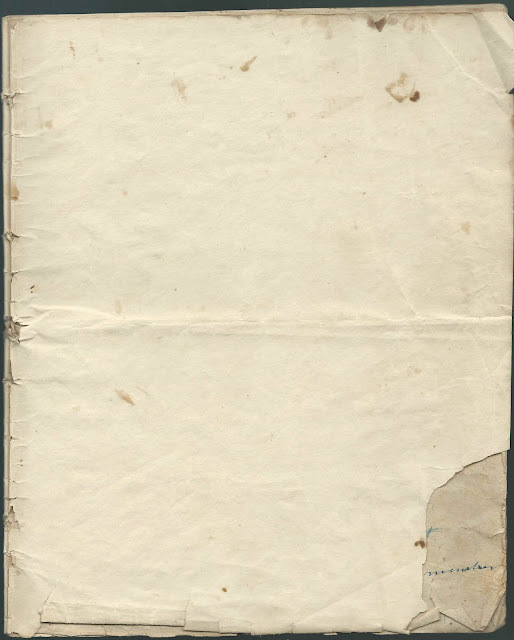 Presumably a daughter of Cotton Chase and Elizabeth (Chase) Chase, but not listed as one of their children in a sketch on page 81 in History of the Town of Cornish, New Hampshire, with Genealogical Record, 1763-1910, Volume 2. 29 - Wife of Mr. John Hall. Lois (Morgan) Hall, as mentioned on page 184 in History of the Town of Cornish, New Hampshire, with Genealogical Record, 1763-1910, Volume 2. 15 - Mr. Jonathan Chase, 72; mentioned on page 65 in History of the Town of Cornish, New Hampshire, with Genealogical Record, 1763-1910, Volume 2. 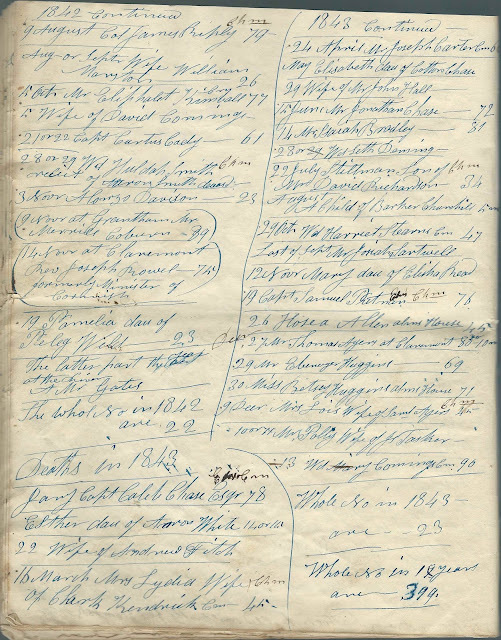 14 - Mr. Isaiah Bradley, 81; as mentioned on pages 31 and 32 in History of the Town of Cornish, New Hampshire, with Genealogical Record, 1763-1910, Volume 2. 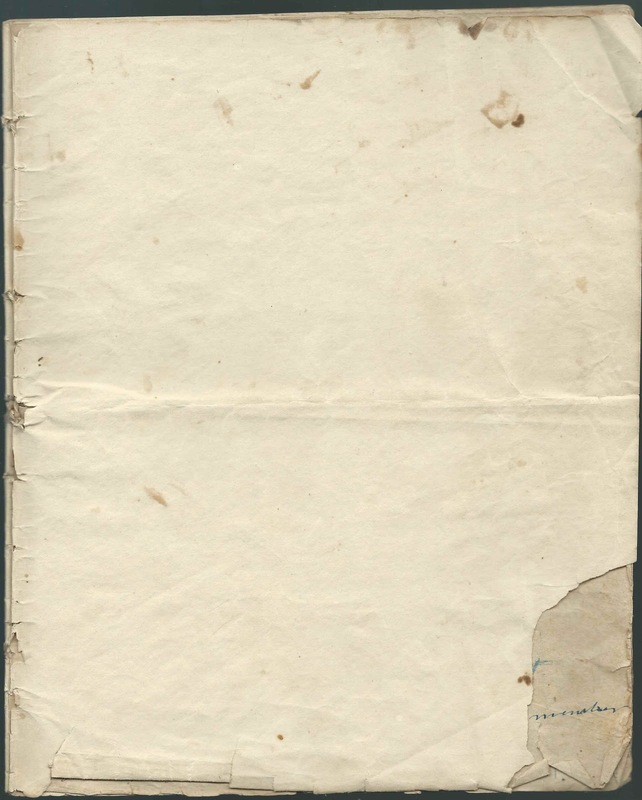 28 [or 29, crossed out] - Widow of Seth Deming. Mary Polly (Gustine) Deming; as mentioned on page 132 in History of the Town of Cornish, New Hampshire, with Genealogical Record, 1763-1910, Volume 2. Her maiden name may have had the variant Gustin. 22 - Stillman, Son of Mr. David Richardson - Chm, 34. Stillman Richardson, born January 7, 1809, son of David Richard and Sarah Goodwin (Ford) Richardson; as mentioned on page 306 in History of the Town of Cornish, New Hampshire, with Genealogical Record, 1763-1910, Volume 2. A Child of Barker Churchill - 5 mo. The child was born in March of 1843, child of Barker Brewster Churchill and Mary A. (Angier) Churchill; as mentioned on page 90 in History of the Town of Cornish, New Hampshire, with Genealogical Record, 1763-1910, Volume 2. Mr. Josiah Sartwell. His name is given as Josiah Sartel in a sketch on page 324 in History of the Town of Cornish, New Hampshire, with Genealogical Record, 1763-1910, Volume 2. 19 - Captain Samuel Putnam, ? Chm, 76; as mentioned in a sketch on page 295 in History of the Town of Cornish, New Hampshire, with Genealogical Record, 1763-1910, Volume 2. 27 - Mr. Thomas Ayers at Claremont, 80 yr, 10 mo. His gravestone, as shown on his Find a Grave memorial, indicates a death date of November 24, 1843, as does his sketch on page 9 in History of the Town of Cornish, New Hampshire, with Genealogical Record, 1763-1910, Volume 2. 29 - Mr. Ebenezer Huggins, 69; mentioned in a sketch on page 212 in History of the Town of Cornish, New Hampshire, with Genealogical Record, 1763-1910, Volume 2. 30 - Miss Betsey Huggins, Alms House, 71; daughter of Samuel Huggins, as mentioned in a sketch of Samuel on pages 209 and 210 in History of the Town of Cornish, New Hampshire, with Genealogical Record, 1763-1910, Volume 2. 9 - Mrs. Lois, Wife of Samuel Ayers - Cm, 45. Lois (Fitch) Ayers, as mentioned on pages 9 and 10 and 155 in History of the Town of Cornish, New Hampshire, with Genealogical Record, 1763-1910, Volume 2. 10 or 11 - Mrs. Polly, Wife of Js. Tasker. Mary Polly (Huggins ?) Tasker, wife of James Tasker, as mentioned on page 363 in History of the Town of Cornish, New Hampshire, with Genealogical Record, 1763-1910, Volume 2. 13 - Widow Mary Comings, Cm, 90. Mary (Cooper) Comings, born July 20, 1753 at Hardwick, Massachusetts, daughter of Deacon John Cooper and Mary (Sherman) Cooper and wife of Benjamin Comings; as mentioned on pages 106 and 107 in History of the Town of Cornish, New Hampshire, with Genealogical Record, 1763-1910, Volume 2. If you notice errors in the transcription or if you have information on any of the people mentioned above, please leave a comment or contact me directly.